Some might say taking a six year old to see "Thor" was a mistake, but EVERYONE wanted to see it, even her. 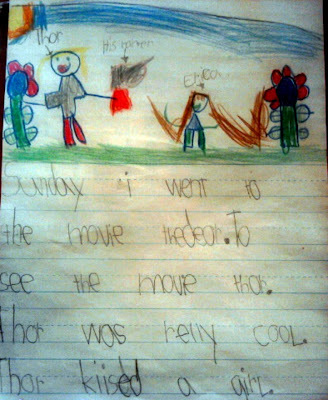 "Thor was really cool. Thor kissed a girl." She asked us Sunday when we said we wanted to all go to the movies as a family that SHE wanted to see "Thor." Good choice as you can tell from her school work today. She wrote this note herself with the illustration- notice the hammer. Everyone, including the six year old girl, loved Thor.